WTB gave me the Trail Boss to use as a front tire in conjunction with the Riddler in the rear. Some of the info for the tires is the same, so I won’t go as in-depth here. Check out my review of the Riddler for a bit more detail. 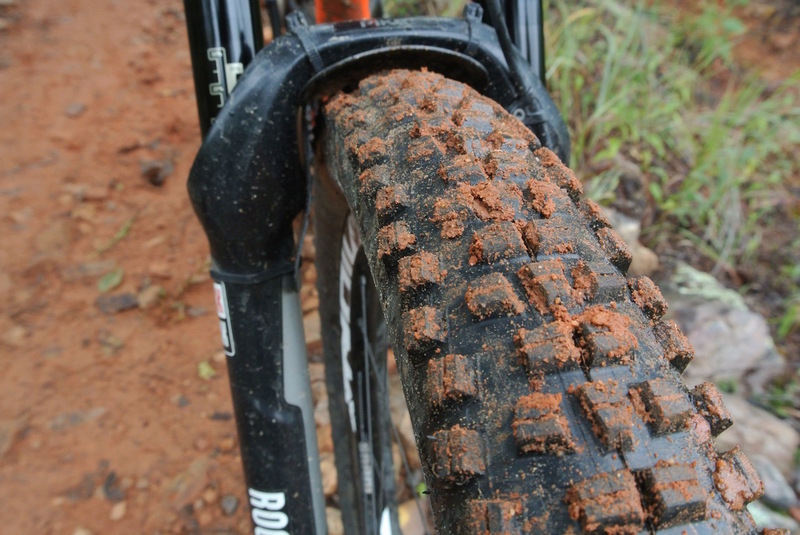 The Trail Boss is WTB’s do-it-all trail tire. 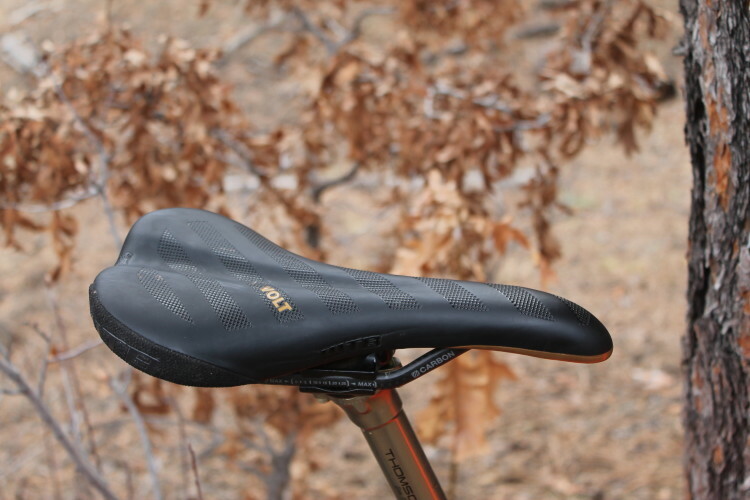 It has knobs that are big enough to bite in the corners and find grip over roots and rocks, but not so big that they slow you down or squirm on hard pack. The center tread has broad, flat, medium-height knobs. Their leading edge is ramped slightly to decrease rolling resistance, and the back of the knobs are straight to provide braking bite. The knobs have sipes (small slits) which run perpendicular to the rotation of the tire. 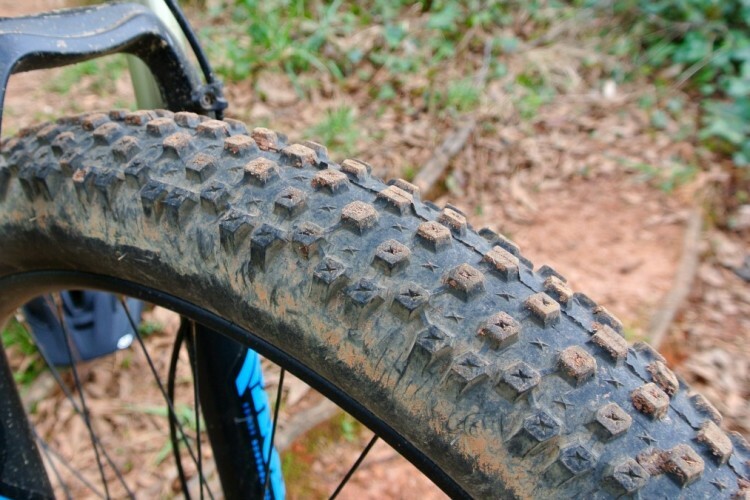 Sipes are used to improve traction, by allowing the knob to flex and increase the amount of surface area in contact with the trail. Side knobs on the Trail Boss are staggered, alternating between being closer to the center line of the tire and then farther out. This arrangement minimizes any dead zone in traction when you’re leaning the tire over. Some tires have an open channel between the center and side knobs, which can lead to a feeling of momentary loss of traction. 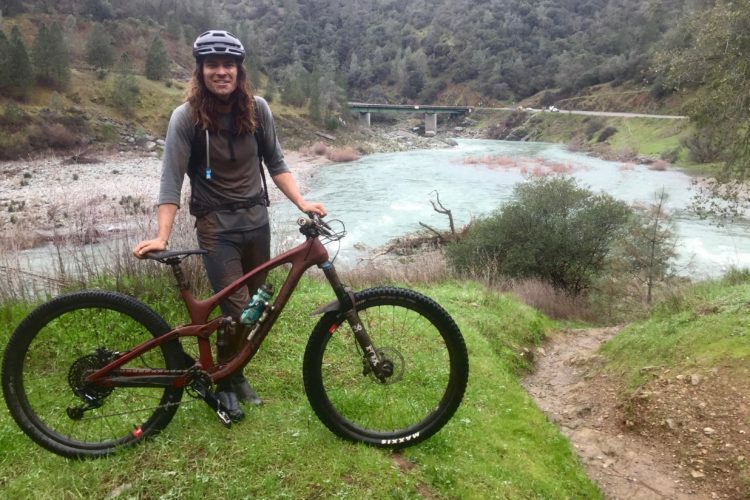 I tested the 27.5″ x 2.40″ Trail Boss with WTB’s TCS Light casing and Fast-Rolling Dual DNA compound. The Fast-Rolling compound is–you guessed it–a faster rolling version of their dual compound rubber. 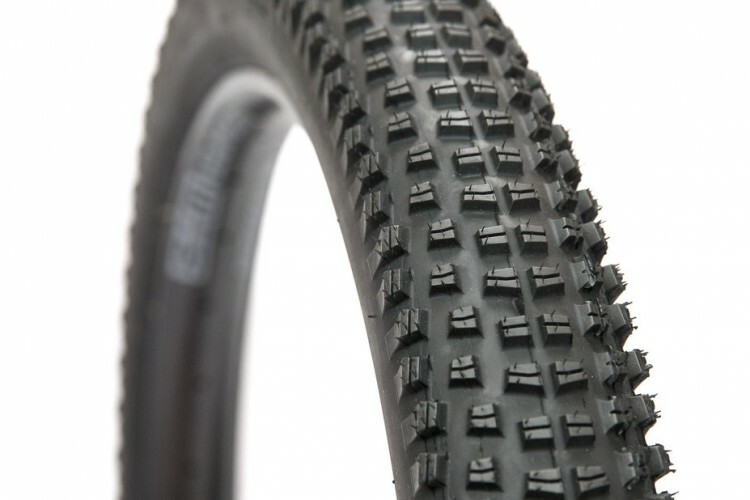 WTB also offers a High-Grip option for the Trail Boss, which uses a softer rubber. Of course, the tradeoff is that it will wear faster. Retail for the version I tested is the same as the Riddler, at $67.95. The TCS Tough versions are a bit more at $76.95. Just like the Riddler, it was a struggle to get the Trail Boss on a rim. Both wheel sets I used–one using WTB’s i25 rims and the other SRAM’s Rail 40–were equally tough. Once on, though, getting them to seat was a snap. After both beads were seated, I deflated the tire and added sealant through the valve. 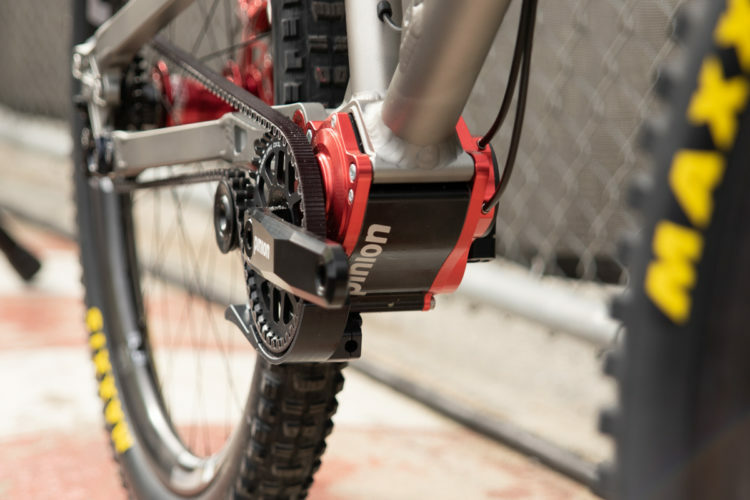 The interface between the tire and rim is so tight, you’ll need a good-quality tire lever to get them on–or off, in the case of a flat on the trail. WTB has found a winning combination of casing suppleness and durability. Both the Trail Boss and the Riddler use the same casing, and they’ve both been excellent. 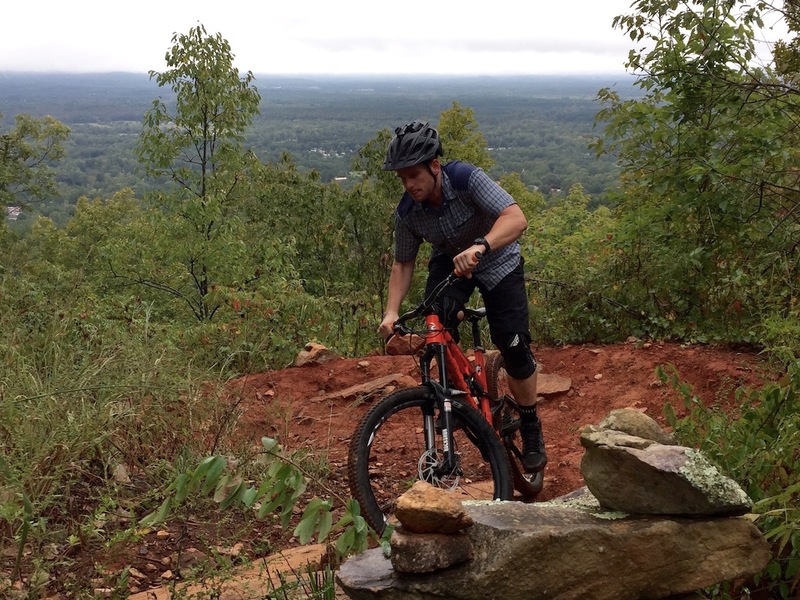 The tires conform to the trail, provide a good ride quality, but are also up to taking on some chunk. I dragged the sidewalls across many roots and rocks, but I did not flat either tire during my testing. With the Riddler mounted on the back and the Trail Boss up front, I had a tendency to ride further over the front wheel than I typically do. 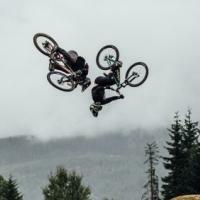 That riding style was rewarded by the Trail Boss with excellent traction and predictable grip. There were no unwelcome surprises with the Trail Boss and no on/off feel. There is plenty of surface area for braking, and the Trail Boss really digs in when you need it. Props to WTB for not getting funky with knob shapes. I would say tread longevity has been above average for a trail tire, with the shoulder knobs just starting to show some signs of wear after a couple hundred miles. The Trail Boss provided a great balance to the speedier Riddler that I used during the test. 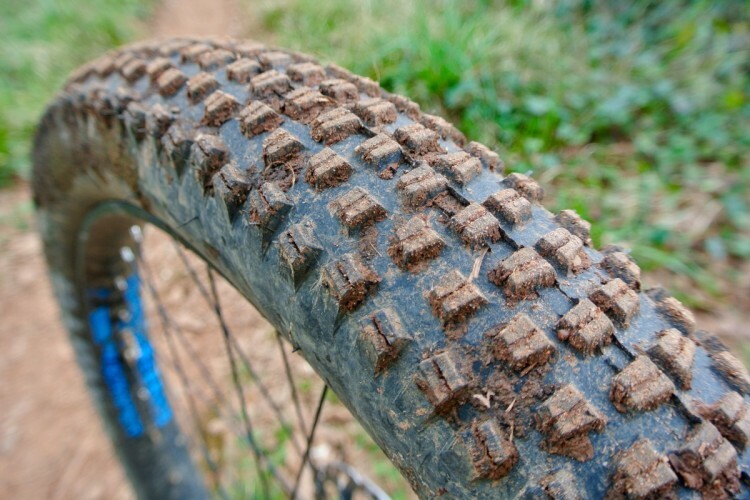 It’s a tire that can handle the majority of the spectrum of trail conditions. I like to refer to tires like these as “set it and forget it” tires. 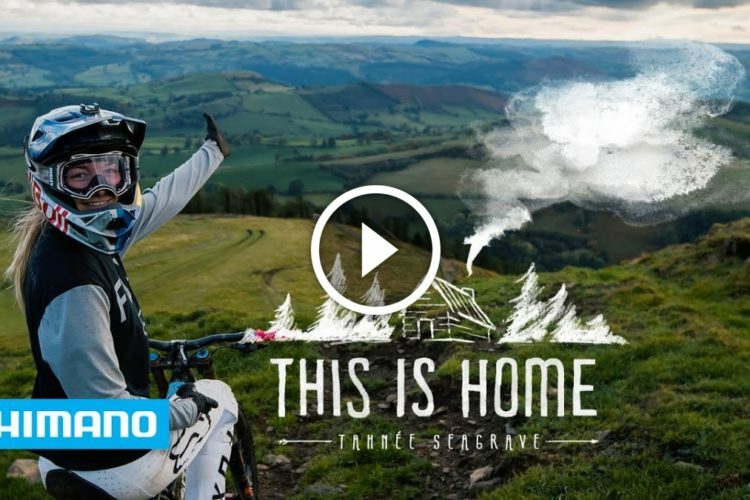 I wouldn’t hesitate to mount up a pair of Trail Bosses and ride them every day, all year. 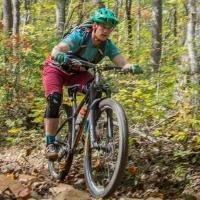 Thanks to WTB for providing the Trail Boss for review. trail boss 29×2.4″ rear and vigilante 29×2.3″ front is my setup and its been totally legit. I switched from trail boss front and rear because the front felt sketchy going into soft turns. I have tcs light casing. The 2.4 on the rear is not actually wider than the vigilante 2.3. They’re about the same width and volume. It’s a great combo. Sounds like a good one. I could see wanting something more aggressive like the Vigilante for soft conditions. 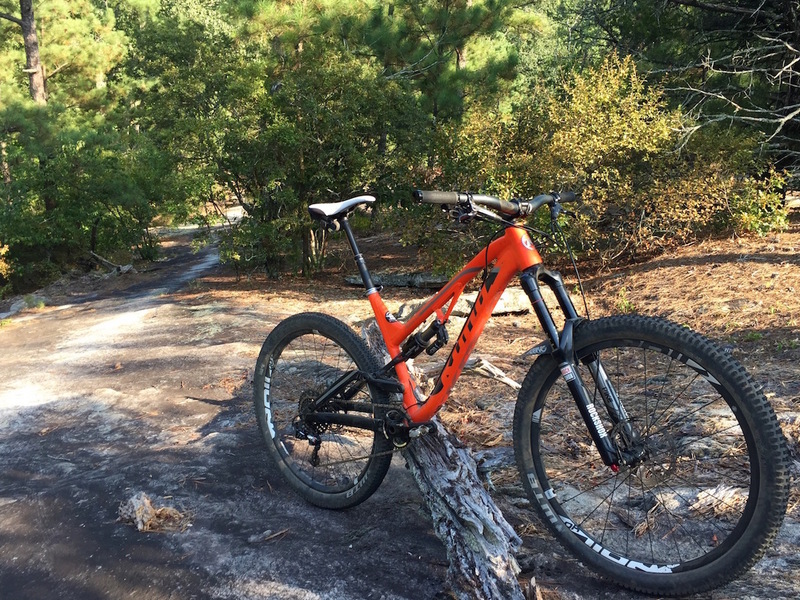 I run the Trail Boss 2.25 on the front for my bike… Maxxis Ardent rear..